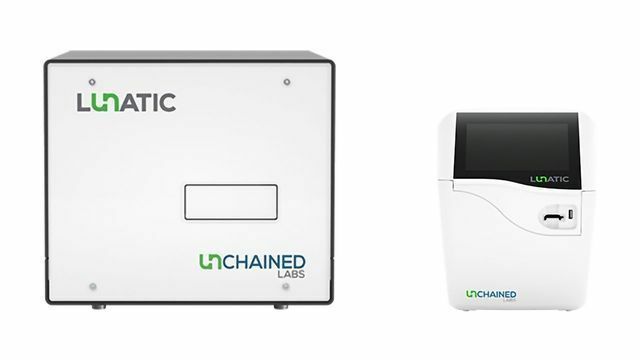 Lunatic makes batch quantification of protein and nucleic acids a no-brainer. All you need is 2 μL and a couple of minutes. Run your samples straight-up, at low or high concentrations, without ever diluting. Lunatic gets biologics and genomics UV/Vis quantification on the money every time. Just drop, load and read. On top of all the classic applications for measuring nucleic acids, Lunatic software lets you see annoying impurities that can mess with your A260 measurements. Find out exactly how much RNA, turbidity, beads, and other influencers are in your DNA samples. Ditch the time-sucking, dye-based prep, and know right away if your samples are good to go. Because the full UV/Vis spectrum is always measured, you can do much more, like check the density of cells in your culture, or assess the quality of plasma samples by measuring components like hemoglobin and bilirubin. Get through 96 samples at a time, in just 5 minutes. Automate your workflow by integrating it with your robot. Even hook it up with a 21 CFR Part 11 package so you can be compliant. The guided touchscreen format is perfectly suited for lighter workloads, with all the same powerful applications. Measure the concentration of up to 16 samples in 2 minutes.